As a reminder, the Justice Department's internal watchdog, Inspector General Michael Horowitz, released a report last week detailing his conclusions from the months-long probe of McCabe, which found that the former acting FBI Director leaked a self-serving story to the press and then lied about it under oath. 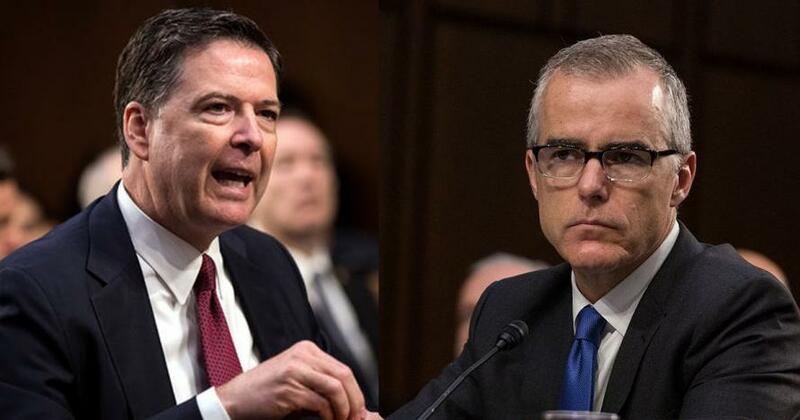 In response, McCabe's attorney, Michael R. Bromwich (flush with cash from the disgraced Deputy Director's half-million dollar legal defense GoFundMe campaign), fired back - claiming that Comey was well aware of the leaks. "In his comments this week about the McCabe matter, former FBI Director James Comey has relied on the Inspector Genera's (OIG) conclusions in their report on Mr. McCabe. In fact, the report fails to adequately address the evidence (including sworn testimony) and documents that prove that Mr. McCabe advised Director Comey repeatedly that he was working with the Wall Street Journal on the stories in question..." reads the statement in part. So to review, McCabe was fired when it was uncovered that he authorized an F.B.I. spokesman and attorney to tell Devlin Barrett of the Wall St. Journal, just days before the 2016 election, that the FBI had not put the brakes on a separate investigation into the Clinton Foundation - at a time in which McCabe was coming under fire for his wife taking a $467,500 campaign contribution from Clinton proxy pal, Terry McAuliffe. Did McCabe in fact tell Comey about the leaks? Is Comey losing his "boyscoutish" charm? Will McCabe and Comey face justice following Wednesday's criminal referral to the DOJ?